Having a baby isn't always rainbows and butterflies, it's hard, it's painful but it's also the most rewarding and incredible thing our bodies can do, which is exactly what one beauty blogger is out to prove with her very honest postpartum photos. It's time mum bods were celebrated not hidden away: scars, stretch marks and saggy skin included. When beauty blogger Ruth Lee had her baby in November 2016, she wasn't like some of the super model mums we see on Instagram, lounging by the pool an hour later, placenta pills ready and waiting. Quite the opposite in fact. After a traumatic 19-hour labour, a C-section, an adult diaper, scars and stretch marks, her beautiful baby was born and now she wants to help other mums realise the postpartum reality is nothing to be ashamed of. Although Ruth had every intention and hope, as most expectant mothers do, of being able to give birth naturally, it didn't quite work out the way she'd expected due to numerous complications. She said in one of her captions: "I was in more physical and mental pain than I had ever been in in my life." 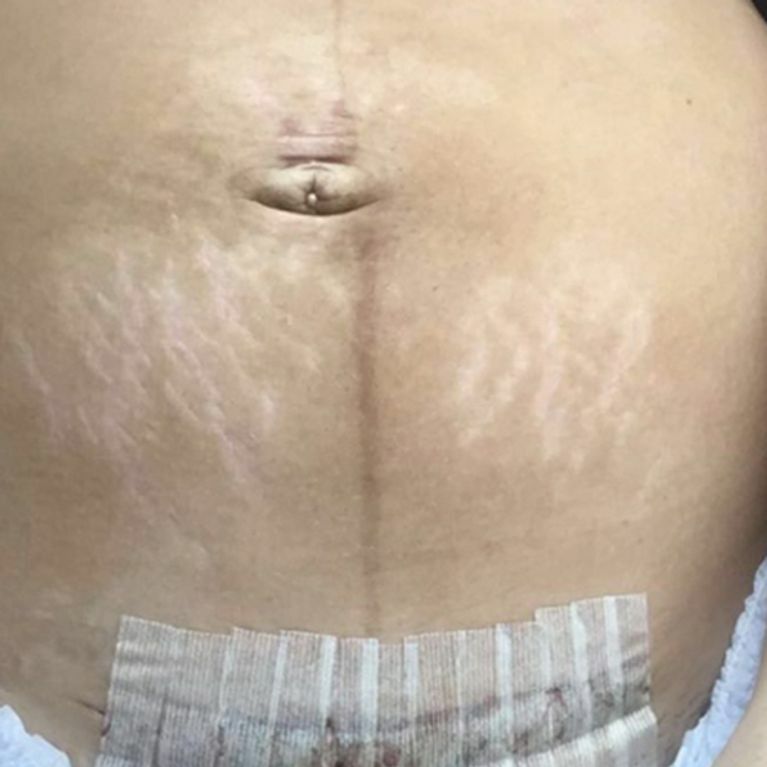 To help other mothers embrace their postpartum bodies, she later posted this image of her C-section scar with her bandage still in place covering the incision, alongside the caption: "I took this picture a few days after I gave birth, when my PPD really first reared its head into my life. I took this and actually was horrified. I couldn't believe it was me. I'm sharing it because I know in my heart that there are people out there that struggle with inadequacy. That might think they are not beautiful, that they might be ruined, less worthy, or not good enough. Yours might not actually be physical scars, but maybe, a failed relationship, a difficulty in your career, a mental struggle, money issues, or just feeling lost in life. Be kind to yourself. And know that you are not alone. Comparison is the thief of joy. Don't let social media taint your view of what is beautiful, what is REAL. And above all, know that if you are struggling, I am here. I have an open inbox or (if you actually know me) an open door. #stopcensoringmotherhood #nofilter." Ruth's body confidence message is an important one for women everywhere and a reminder that our bodies are beautiful and powerful - scars and all. The picture-perfect birth conveyed on social media can leave mothers feeling inadequate and resentful towards their bodies for letting them down or not bouncing back quick enough, but as Ruth points out learning to love your mum bod for the amazing life story that it is, complete with lines and scars to mark the journey along the way, is what we should be focusing on. Being a mum is hard enough without beating yourself up for every imperfection. Ruth, if you're reading - we heart you!